SHARON – Every Monday evening, 18 adults crowd into a small classroom at Temple Israel in Sharon. Many have already put in a long day at work —developing software, seeing patients, writing marketing copy and attending college. On a recent evening, prophecy was on the agenda – Old Testament prophets Jonah and Elijah specifically. For the next three hours, with the help of biblical scholar Dr. Lynne Heller, the students grappled with the question of whether each prophet succeeded or failed in his mission. They analyzed the prophets’ characters and motivations, examined their relationship with god and rethought some long-held assumptions. Welcome to Me’ah, Hebrew College’s answer to growing interest, locally and nationally, in Jewish history. 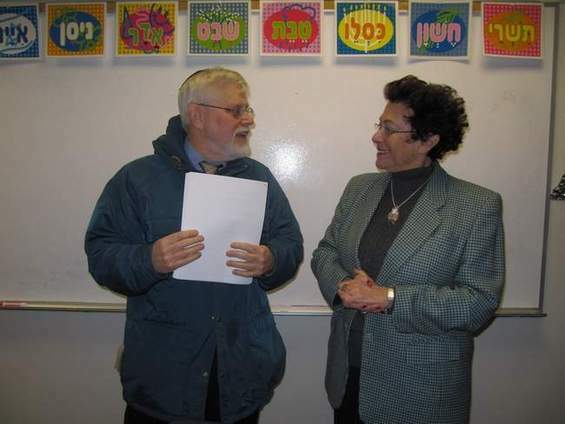 Me’ah, which means 100 and refers to the number of hours students spend in the classroom – is an adult education program offered by Hebrew College and Combined Jewish Philanthropies at sites in eastern Massachusetts, including Natick, Newton, Needham and Lexington. Next year, the course will also be offered in the evening at three downtown Boston locations to accommodate busy professionals. Students, who hail from all backgrounds, study the major texts of Judaism – the Hebrew Bible and Talmud – as well as Jewish history from medieval times to the present. It’s a sweeping, yet intellectually rigorous, dive into Judaism’s dominant religious, intellectual, legal and cultural ideas – taught by college professors who are experts in their content areas. As is typical in Me’ah classes, many Sharon students are inspired to continue learning. Student Steve Baturin, a software developer, began studying Torah and other Jewish texts as an adult and was bar mitzvahed in his 20s. “Me’ah provides me with new insights, it’s a different way of understanding material that in some cases I’ve read many times on my own,” said Baturin. Heller said one of the many things she loves about teaching the course is how the material speaks to people on so many levels.